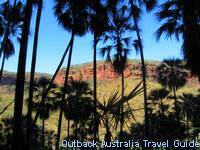 Gregory National Park (now called Jutpurra National Park) is a spectacular 13,000 square kilometre wilderness area in Australia's Northern Territory, starting 200 km west of Katherine. It's mainly a park for outdoor and four wheel driving enthusiasts, but not only! On this page we'll look at how you can safely explore and enjoy this wilderness. 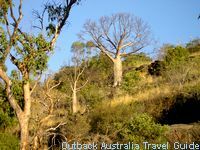 Update: In May 2010 the park was returned to its traditional Indigenous owners and renamed into Jutpurra National Park. The Victoria Highway, which connects the Northern Territory with the west coast, leads through the eastern part of Gregory National Park. You can get a first glimpse of the dramatic escarpments as you drive through. If you come from the Northern Territory side that is... Most people do. 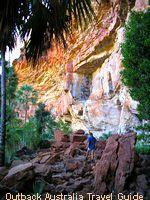 If you reach Gregory National Park coming from Darwin/Katherine you will notice a difference. The tropical habitats that make up most of Australia's "Top End" give way to semi-arid landscapes. 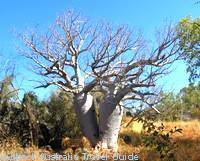 You will also for the first time see the unique boab trees, which can only be found here and across the Kimberley region. Striking gorges, rugged sandstone and limestone terrain, big rivers with fascinating flora and fauna and signs of a rich Aboriginal and pastoral past beckon. Many of the parks attractions require 4WD (four wheel drive) to access. Actually, the four wheel drive tracks are an attraction in itself. But there are also some walks and lookouts that you can enjoy without even leaving the highway. Let's take a closer look at the remote wilderness that is the Northern Territory's second biggest national park. Head west from Katherine on the Victoria Highway and you can't miss Gregory National Park. The highway cuts right through the Victoria River sector, the first of two separate sections of the park. The roadhouse also offers a camp ground, motel rooms, meals, Victoria River boat tours and more. Don't forget to fill up your tank while you're there. If you are coming from the Kimberley you will first reach Timber Creek. Fill up your tank at the roadhouse and ask for directions to the Gregory National Park Visitor Center (Parks & Wildlife Commission) and ranger station. It's just around the corner. At the Visitor Centre you can find all the information and maps you need. The access road to the western part of Gregory National Park turns off the Victoria Highway 10 km east of Timber Creek. How much you can see of Gregory National Park depends on your vehicle. Most of the park is only accessible by four wheel drive. But since the Victoria Highway runs right through the middle of the smaller eastern part there are several walks and lookouts that anybody can get to. You don't even have to leave the highway. This walk starts right at the highway, only 2 km from the roadhouse. The escarpment walk is a 3 km return rocky and steep track that takes you to the top of the ridge from where you have breathtaking views over the Victoria River and the escarpments. Along the trail you find signs and displays that explain the Nungali and Wardaman people's dreamtime stories of the area. The trails is not technically difficult but it is steep in parts and you should definitely take some water. Allow an hour or two, depending on how fit you are. Don't miss this one! Look for the turn off to the picnic area 10 km west of the Victoria River Roadhouse. The 2 km access road is unsealed but ok for 2WD. The drive in and the picnic area itself are already spectacular, but the walk leaves you speechless. The 1.7 km loop walk takes you up the slope to the base of the escarpment cliffs. It follows that cliff and eventually turns down again and leads you back to the car park along the valley. The whole slope is covered in Livistona palms and the higher you get the lusher the vegetation becomes. Once you reach the cliffs you are walking in the shade of unexpectedly dense tropical vegetation. Ferns are nestled in cracks of the wall where water is still trickling down at the very end of the dry season. From the deep cool shade you look out over the sun drenched valley to the dramatic escarpment cliffs on the other side. The crossing is not far from the roadhouse, you will see the sign. This is where the old highway used to cross the river before the bridge was built. The access is strictly four wheel drive only, but it's not far, you could walk down to have a look. It's a pretty spot and inviting to dip your feet in the water. But don't even think about swimming! The Victoria River is full of saltwater crocodiles. Bullita Homestead is 42 km from the highway and gives you good insights into the life of the early pioneers and pastoralists. It's a nice place to escape the heat of the day for a while and to do some time travel. The Bullita Campground is not far from the homestead, just follow the signs. It's on the banks of the East Baines River and you can go down to the river crossing and try to catch some dinner. To get to the scenic Limestone Gorge take the turn off 34 km along the Bullita access road. Despite what some brochures say, you do need a four wheel drive to get to the campground at the end of the 8 km track. The Calcite Flow Walk 2 km before the campground could possibly be reached in a 2WD, but take it easy and be prepared to turn around if the track gets too difficult. The Calcite Flow Walk is a short and easy walk and gives you good views over the limestone formations that this part of Gregory National Park is famous for. The 1.8 km Limestone Ridge Loop Walk starts at the campground. It winds along the ridge through the interesting limestone landscape, gives you good views over the East Baines River Valley and interesting explanations about the local flora. Gregory National Park contains a network of four wheel drive tracks. These tracks really are for the four wheel driving enthusiast. You need to be well prepared and well equipped to tackle them, but if you are you will see some spectacular wilderness country. Basic camp sites are located along all of the tracks. Bullita Stockroute (90 km/8 hrs): A loop track from the Bullita homestead leading back onto the Bullita access road. Humbert Track (112 km/6 hrs): This alternative exit route takes you to the Buchanan Highway. Wickham & Broadarrow Tracks: Both lead into the very remote southern regions of the park and eventually meet the Buntine Highway between Top Springs and Halls Creek. If you want to do the full round trip, down one track and back the other, allow three days. Let me repeat that this are serious and challenging trips for experienced drivers. You need to be well informed, well prepared and totally self sufficient. You also need to register with the rangers and obtain a permit.